E Ink Holdings, the leading innovator of electronic ink technology, and Fujitsu Semiconductor Limited announced the joint development of a reference design board for battery-less ePaper tags. The solution adopts E Ink's low voltage ePaper module and Fujitsu Semiconductor Limited's UHF FRAM RFID LSI, creating an ideal combination to enable battery-less ePaper tag applications. 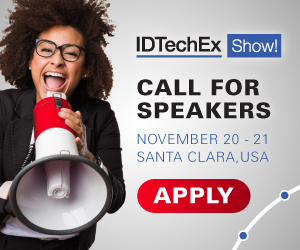 For more information see the IDTechEx report on RFID Sensors 2018-2028. This novel application was a collaborative effort between the ecosystem partners, including E Ink, Fujitsu Semiconductor, and Toppan Printing. The reference design board enables data transfer distances of up to 20 cm, enabling the tag to be updated at any time without data storage restrictions. "E Ink is continuously working to improve and develop new power saving ePaper solutions," said Johnson Lee, President of E Ink Holdings Inc. "Combining two major trends in the electronics industry, battery-less and energy harvesting, this unique logistics ePaper tag will be a game changer in the logistics management industry. Japanese convenience store chains have already noticed the environmentally friendly value the ePaper tag brings, and are expected to deploy ePaper logistics tag solutions to replace paper tags in Japan." "The technology collaboration by E Ink and Fujitsu Semiconductor Limited resulting in a battery-less ePaper solution," said Masato Matsumiya, VP Head of System Memory Company of Fujitsu Semiconductor Limited. "The reference design board enables maintenance free performance and the inclusion of FRAM allows for low power consumption, fast writing speeds and a non-volatile system. This enables the tag to be updated at any time without data storage restrictions. This technology will generate innovative applications in new markets." "The combination of E Ink technology and the UHF band, widely used in the logistics industry, is a world's first and has promising potential," said Shinji Ooi, General Manager of Business Development Center of Toppan Printing Co., Ltd. "We are working towards early commercialization of this combination." Toppan is developing and will produce battery-less tags initially for Japanese convenience store chains and then for the general logistics and manufacturing sectors. The battery-less ePaper tag solution will be targeted in applications such as logistics tags, ePaper badges, ID cards or electronic shelf labels.